Basal cell carcinomas (BCCs) are one of the most frequent cutaneous malignancies. The majority of BCCs are reported to occur on the auricular helix and periauricular region due to ultraviolet light exposure. 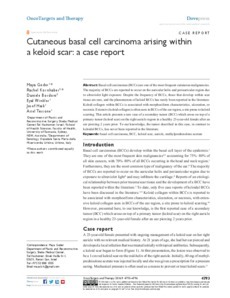 Despite the frequency of BCCs, those that develop within scar tissue are rare, and the phenomenon of keloid BCCs has rarely been reported in the literature. Keloid collagen within BCCs is associated with morphoeiform characteristics, ulceration, or necrosis. Extensive keloid collagen is often seen in BCCs of the ear region, a site prone to keloid scarring. This article presents a rare case of a secondary tumor (BCC) which arose on top of a primary tumor (keloid scar) on the right auricle region in a healthy 23-year-old female after an ear piercing 2 years prior. To our knowledge, the tumor described in this case, in contrast to keloidal BCCs, has never been reported in the literature.